Developer attorney and Councilmember Fred Gaines appears to be leading the yes on Measure F effort in Calabasas — so the city and the developer can proceed with building the massive Canyon Oaks Hotel and New Homes subdivision — on our spectacular Las Virgenes Road, the gateway to the Santa Monica Mountains National Recreation Area. Their expensive and numerous full color flyers are rife with misrepresentations and rampant misinformation geared to confuse and trick voters into thinking that a yes vote, “means more open space”, “protects us against overdevelopment”, “fewer cars”, etc. How absurd! This is disingenuous at best and manipulative to say the least. 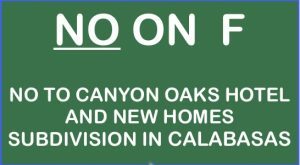 If you would like to help get the NO on F (NO Canyon Oaks hotel and subdivision) information to constituents by volunteering to walk a neighborhood or call voters — or importantly DONATE funds to the NO on F campaign – then contact Joan Yacovone at tyacovone@roadrunner.com. If you click on this link: http://lvhf.org/no-on-measure-f-donate-here/‎, it will take you directly to the NO on Measure F donation page. Donate any amount – every single dollar and donation is crucial. If you would prefer to mail a check, you can send it to: Treasurer, LVHF, Box 353, Agoura Hills, CA, 91301. 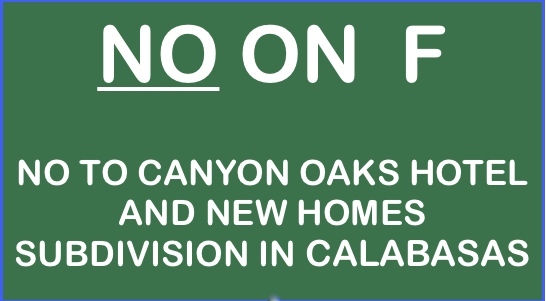 This Canyon Oaks mega development negatively impacts our biological and scenic resources and all of our communities – not just those in Calabasas. This entry was posted in News by lvhf. Bookmark the permalink.